Opened on 15 June 1874 by the Poole & Bournemouth Railway, Bournemouth West Station was the terminus of the line from Poole. Initially, it consisted of just two platforms. However, by 1886, the line had been doubled and extended on to Bournemouth East. At this time the Central Station did not exist. The East station, also long gone, was located on the eastern side of Holdenhurst Road. It later became a parcels station, and later a B&Q. The site is now occupied by a bus garage and student accommodation. West station was further enhanced when the Somerset & Dorset reached the town and made it its terminus. At this time, of course, Bournemouth was in Hampshire – not coming under Dorset until 1974, some 9 years after the station closed. Bournemouth was also much smaller than it is today, and in many respects the railway was not welcome. This is why it is mostly in deep cuttings – hidden from view. Today, of course, this gives the advantage of not having any level crossings to delay traffic, although some bridges can be rather narrow and only allow one-way traffic. Because of its location, Bournemouth West Station remained a terminus, and a triangle arrangement was made at the Branksome end. At the east end of Branksome station, the junction still remains, as this is used for access to the motive power depot. In the centre of this triangle was the goods depot. This is now a Car Park. Also within the triangle, in the eastern corner, was the Somerset & Dorset motive power depot. The current depot, which runs alongside Wessex Way (where the carriage wash can just be seen from the road) is on the site of the former carriage sheds for the London & South Western Railway. The end came when the line from Waterloo was electrified. Initially, it was thought that the Central Station on its own would not be able to cope. However, when Bournemouth West Station was closed temporarily during the works, it was realised that in fact Bournemouth Central could cope. Also, the remaining Somerset & Dorset traffic was soon to end, so the West Station never reopened. The A338 Wessex Way was subsequently driven through the northern edge of the site, and a car and coach park occupies the remainder. View eastward, to buffer-stops; terminus of ex-LSWR main line from London and Southampton via Bournemouth Central, also of lines from Poole, Broadstone, Wimborne etc. including the Somerset & Dorset Joint (S&DJ) line from Bath via Templecombe. 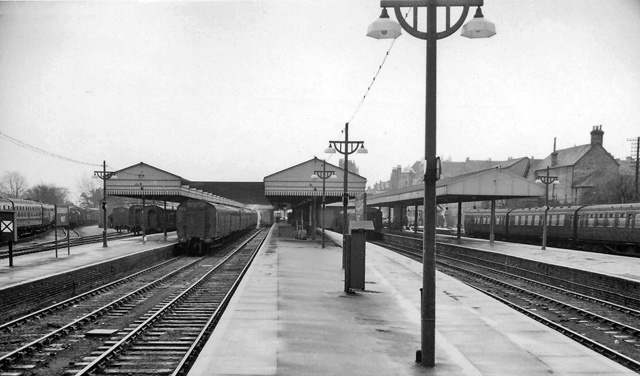 The station was closed completely on 4/10/65 and all remaining services diverted to Bournemouth Central. Replicating the view above as it is today. The former Queens Hotel, later the Pig & Whistle, is now the Co-op. © expat. Creative Commons Licence [Some Rights Reserved] © Copyright Ben Brooksbank and licensed for reuse under this Creative Commons Licence. Scene looking east after closure. I used to live at Bourne Hall, a stones throw from what was Bournemouth West railway station where the car/coach park is now. I never knew it was the station. How sad it makes me feel we have lost these stations.